Autoquip offers a patented pneumatic pump control providing automatic pump pressure reduction when the circulation system back pressure is not required to spray. Our Pump Flow Control technology delivers energy savings, reduced coating degradation and less premature pump wear, which can occur every time the coating is being circulated and not sprayed. Our solution can be integrated into an engineered system that can be used for most coatings used for manual hand guns and automatic gun applications. 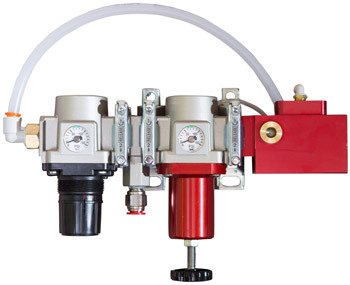 The Autoquip Pump Flow Control can regulate both air pressure and flow to pneumatically driven pumps. This device can also be used to eliminate problems associated with transferring energy to run away pumps utilizing pressurized air and pressure controlled regulators. Until this technology was proven, the speed control and/or non-production mode function was not available for pneumatic pumps. With the introduction of Autoquip’s Pump Flow Control for pneumatic pumps, customers will realize cost savings in air consumption, along with longer lasting pump seals. Additionally it will keep coatings in suspension, but will not shear the paint as it normally would when utilizing a typical back pressure regulator (BPR) in the circulation system. In the past, the downside to pneumatic pumps included increased energy usage, lack of speed control, condensation under heavy load, and if incorrectly sized or installed could require more frequent maintenance. These issues are no longer a problem when utilizing the Autoquip Pump Flow Control in your circulation system.